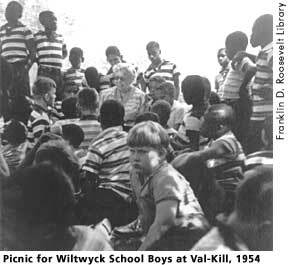 First opening its doors to African American juvenile delinquents in 1936, the Wiltwyck School for Boys was located in Esopus, New York, on the opposite side of the Hudson River from the Roosevelt's family home. The school, under the leadership of the Episcopal City Mission Society, experienced some initial success at treating the troubled youngsters who attended, most of whom had grown up in undesirable and neglected sections of New York City. However, by 1942 Wiltwyck suffered from a such severe lack of funds that it was in danger of closing. In 1942, several remarkable women, particularly the first lady, Eleanor Roosevelt, helped reorganize the school and joined its board of directors. ER, a former teacher, had been moved by the courage that the Wiltwyck Academy had shown in taking an interest in underprivileged African American children and immediately wanted to help in any way that she could. That same year Wiltwyck ended its affiliation with the protestant church and became an interracial treatment center for young boys between the ages of eight and twelve. Because a significant portion of the school's budget came from private donations, ER's role in raising money for the academy was crucial to its survival. It was a task that she remained wedded to for the rest of her life, even up until her last months in 1962 when she busied herself soliciting monies to relocate the academy to Yorktown Heights, New York. The school itself managed to survive for another nineteen years after Roosevelt's death, but was finally forced to close its doors in 1981 due, ultimately, to a lack of money. Beasley, Maurine, Holly C. Schulman and Henry R. Beasley, eds. The Eleanor Roosevelt Encyclopedia. Westport, Conn.: Greenwood Press, 2001, 567-569. Black, Allida. Casting Her Own Shadow: Eleanor Roosevelt and the Shaping of Postwar Liberalism. New York: Columbia University Press, 1996, 107.